Monarch Air Group provides private air charter in Charleston, SC. Our clients benefit from top-notch service, unrelenting dedication to safety, wide selection of aircraft, and years of experience in chartering private jets. To obtain a free quote, please use our online quoting tool provided below, or call toll free 1-877-281-3051. Monarch Air Group offers private jet charter services to and from Charleston, SC, USA. 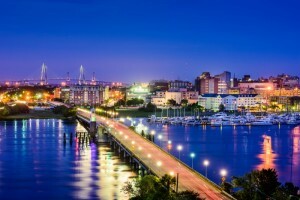 The second largest city in South Carolina behind Columbia Charleston is a city with a rich history, strong Southern tradition, and a talent for homemade pie. It is attracting nearly 4 million visitors a year. Thanks to city’s location and prominent role in the Revolution and Civil wars, Charleston is filled with magnificent churches, grand mansions, wonderful gardens, outstanding accommodations, a fashionable boutiques line entertainment, and a natural southern cuisine. Being one of the most well known cities in the United States Charleston has good hospitality and history and it’s a definite must see place for all travelers. 1. ADR, Andrews, Andrews, United States. 2. BFT, County, Beaufort, United States. 3. CHS, Charleston, AFB Municipal, Charleston, SC, United States. 4. GGE, Georgetown, Georgetown, United States. 5. HHH, Hilton Head, Hilton Head, United States. 6. LRO, Sharpe AAF, Lathrop, United States. 7. RBW, Municipal, Walterboro, United States. 1. Charleston Place Hotel by Orient-Express, 205 Meeting Street, Charleston. 2. Market Pavilion Hotel, 225 East Bay Street, Charleston. 3. Holiday Inn Express Hotel & Suites Mt Pleasant-Charleston, 350 Johnnie Dodds Boulevard, Mount Pleasant. 4. Wentworth Mansion, 149 Wentworth Street, Charleston. 5. The Spa at Charleston Place, 205 Meeting Street, Charleston. 6. Francis Marion Hotel, 387 King Street, Charleston. 7. Embassy Suites Hotel Charleston Historic District, 337 Meeting St, Charleston. 8. Charleston Place Hotel by Orient-Express, 205 Meeting Street, Charleston. 9. Mills House Hotel, 115 Meeting Street, Charleston. 10. Francis Marion Hotel, 387 King Street, Charleston.